We are told it is better to be a “Confused Socrates” than a “Satisfied Pig” … but what I find instead across most media today is an alarming number of Confused Pigs … lazy, opinionated narcissists with an abundance of loudspeakers to express their muddled thinking. My apologies for adapting John Stuart Mill’s 1861 quote, but how did we get to such a state where important debates and global issues are being led by people who don’t read, don’t care about other views and can’t be bothered to learn basic facts. Most of these confused pigs assert their influence or are in power. Welcome to Part 3 of the Untelligence Trilogy. In this article I will try to understand how the “Arrogance of Ignorance” developed – how we became happily untelligent. How did social media create a population so attracted by expressing themselves on all topics while at the same time repulsed by having to inform themselves on any? Let’s start with a definition. A confused pig is someone quite content to wallow in a comfortable opinion, emotionally rewarding and reassuring while often having inherent contradictions. Confused pigs do not critically analyse these opinions; as they are socially reinforced by their community, there is no need nor incentive for rational reflection. Driven by a bipolar bias, should one disagree with such a pig, the adversary would more likely be dragged down into the mud than having the conversation lifted to a higher intellectual level. Confused pigs want comfort in ideas, not confrontation in thinking, so they will personally attack any challengers to avoid demonstrating their incomprehensible untelligence. Confused pigs do not see any hypocrisy behind their self-interested views (for that would involve a level of analysis and depth of reflection such a sow is simply incapable of). These boars are happily untelligent: supplanting information with affirmation, evidence with emotion and dialogue with diatribe. They get their untellectual support from their social media tribes: the sties of stupidity. Ignorance, shared communally, becomes intolerance. Social media has created the perfect setting for such ignorance to proliferate, often below the radar of authorities and the wider population. Pigs read memes and consider it research. They take their opinion and look for quick links to justify it, surrounding themselves in herds of hypocrisy. These sounders reject dialogue and create atmospheres of animosity, to the point where it becomes OK to firebomb an abortion clinic, attack minorities or threaten the lives of professors. Boar taint leaves a bad taste on society. Only a cunning sausage-maker would tell people who can’t conceive it’s because they don’t eat organic. Manipulative opportunists who have a taste for pulled pork have devised campaigns to send these piglets squealing right into their marketing pens. Fear and mistrust are keeping these sows submissive within social media echo-chambers allowing ignorant emotional untelligence to assume the position of facts; allowing anecdotes to posture as evidence; and allowing the crowd to confirm crude convictions of intolerance. From activist attacks on vaccines, conventional farming and medicines, social media has created the situation for such swine to bury science in the mud. Political swine are using these tools to push the extremes on the far right and the far left (as election results over the last few years attest). When you are rolling in the muck of intolerance, it is easy to assume the stink is coming from the other side. How is it that these pigs can remain happily confused and oblivious to any obvious information that might challenge their memes and tweets? Confused? Just Wallow in it! Such pigs do not ask questions, reassess their positions or seek knowledge – they are happy with the swill they share assuming no need for further introspection. I teach a course to young business entrepreneurs which is essentially a primer in critical analysis. The first lesson centres on how to ask questions. In universities, students are taught how to answer questions but there is no textbook on the long-lost skill of questioning (indeed, I am forced to go back to that confused Socrates and his method that so irked the swine of ancient Athens). As social media tools make us more reactive and less critical, we are losing the capacity to analyse objectively – we don’t know how to ask a question. We are no longer taught how to ask questions. We are no longer capable of weighing ideas objectively. We are no longer able to discern what information we need from what we want. Google gives us the information we want, untelligent, but emotionally rewarding. How did Jenny become a leading expert on vaccine safety? Finding information has not only become far easier, it has become personalised. We now choose the data we want to fit our beliefs (disregarding the rest), we block sites or individuals that challenge our preconceptions and find the path of least resistance to live life as untelligent, confused pigs. I called this the Age of Stupid not because others are stupid (and clearly I am not), but rather that our social media tribes allow us to surround ourselves with the bias and beliefs of like-minded people … to the point that I have lost the capacity to discern other views to determine whether I, indeed, may actually be the stupid one. In a millennial-driven age, people no longer have to work for their information but can now access whatever they want to learn from their smartphones. They merely follow instructions, follow the arrow on their maps, like or share short snippets and respond to large volumes of immediate, visual stimuli. We have lost the capacity to be analytical, to ask questions, challenge countering viewpoints or take an objective position. Postmodernists tell us this wasn’t important anyway. Pigs are satisfied with what they think they know without being aware of their limitations and untelligence. Confused pigs do not ask open-ended questions (who, what, where, why …). They are not seeking information, but merely confirmation of what they think they know. The only knowledge important to such swine is how they are right (by asking closed-ended “yes” or “no” questions which are not really questions at all). For example, they will ask: “Do vaccines cause autism?” rather than “How are vaccines tested for safety?” They are not interested in learning “Why glyphosate is used?” but rather “Is glyphosate carcinogenic?” Closed-ended questions confirm ignorance and breed untelligence. Finding the answers we want rather than the knowledge we should have has been made easy via the power of the algorithm, where search engines send us to where we want to be and almost always answers “Yes!” to any closed question. Google doesn’t want confused pigs to learn, it wants them to be satisfied. So search engines take search histories into consideration when looking for information, sending the swine to the sounder where the swill is best shared. If, for example, I asked a question: “Will vaccines give my child autism?” Google senses from my search history what I want to hear and where I want to go. 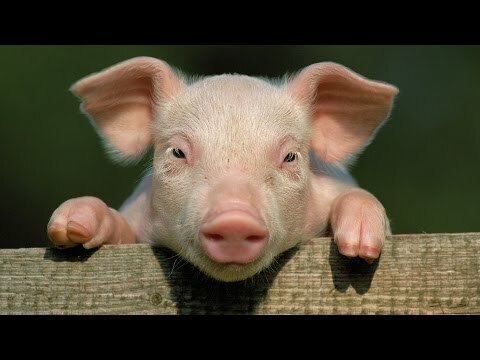 Google directs confused pigs to the troughs they want to feed from, confirming what they think they already know and comforting them with the confidence to ignore challenging ideas. These pigs wallow in their ignorance … oblivious to basic facts or evidence! Confused pigs go hog wild for their gurus. These gurus (from Shiva to Wolfe to Mercola to Hari) dictate to their followers what they want to hear, need to think and how to react. They’ll consume any slop served to them and the gurus have been adept at packaging trough-fulls of turpitude to the ignorant herd. The gurus think they’re boars digging up truffles when in reality they are burying knowledge under the grunts of their own greed. When Mercola or Zen tell you your vaccines may not be safe, they reassure you with a lifetime supply of expensive supplements that might protect your child. The squealing piglets will not take the time to read the disclaimer that their statements are not scientifically proven or FDA-approved. When organic food lobbyists or their paid scientists pretend organic food contains no pesticides or that seed breeding is dangerous, their hungry hogs come, deep-pocketed, to the trough in a straight and narrow line. That stench emanating from the guru pig-farms is starting to make the larger population feel uncomfortable. Untelligent swines don’t see how they are being swindled by this guru swill. When a lawyer pays off a scientist to get rich suing a research company, everyone cheers. When an activist guru is funded by a company to spread fear and uncertainty about its competitor’s product, the media goes into overdrive to ban the substance. When a university toxicologist is running a consultancy, no one sees any conflict of interest. When the Risk-Monger tries to get people to see this hypocrisy, he loses his job. If these boars were to keep to their heap, that would be fine, but they splash their muck all over the place, muddying up rational discussions. There are, however, ways to deal with confused pigs (other than endless insults and confrontation). When my trolls bother me, I often provide them with links to my blogs. As that entails reading more than a meme, they often then leave me alone. I can’t tell you how many times (almost daily) I have had to deal with people who think they are clever attacking me on social media without ever reading my blog. Some openly admit they never read what they reject – they just assume they know what I am going to say. Opportunists try to appeal to the confused pig’s innate narcissism, providing empty platitudes to stroke needy grunts. These people are doing well in politics. I prefer to call it as I see it. But as that famous Muppet character has demonstrated, reality is what you choose to allow in, and many pigs think quite highly of themselves. When will these pigs start asking questions rather than showing off what they think they know? When will these porkers realise that opinion is not fact, anecdote is not evidence and those swine wallowing next to them do not constitute the truth. Until these pigs learn to ask open, honest questions, untelligence will define the muck we’re all forced to wallow in. This concludes the Untelligence Trilogy. RM note: I expect to be roundly attacked for this blog so let me start with an apology to farmers who do indeed know better about my portrayal of such porcine pestilence. I know very well that pigs are quite sociable creatures and very intelligent. My use of the term is a play on John Stuart Mill’s quote, for literary licence and is not meant to demean pigs to the level of ignorance I often find in comments made by my Internet trolls. And let us not forget that pigs have manners. Finally some one who expresses it in a word and calls it for what it is. Cult of fear, based on division and derision where the pigs are so divisive they will even eat their own. So then, a small list of non critical cult of fear includes long held science on our food sources, vaccines, medicine, MD practitioners, climate, environment, plastic, health care, education, ethnicity in cultures and in 2 generations the loss of a same age demographics moments thought regarding what 60-80 million sacrificed lives to afford that what is lost on that same demographic today and the list grows …. Culture debilitated by fear, ignorance (as in non critical) and inability to critique or stand on a well researched thought, in a society who paid the price to extoll those freedoms.